Charities and non profits around the world are participating in Multiple Sclerosis Awareness month. This month MS will be pushed into the spotlight in order to raise money for vital research and support those with the disease. Every little bit helps. Awareness results in more fundraising efforts, more money, more research and, eventually, crucial steps towards finding a cure. MS is a disease of the central nervous system that damages or destroys the myelin surrounding the nerves and can also injure the nerves. This condition affects 2.5 million people worldwide, mostly women. About 400,000 of MS sufferers are American. While there is no known cause or cure for MS, community support is vital to improve the lives of patients and their families. Treatments are constantly improving and MS patients have a better quality of life than ever before. So what can you do to help raise awareness? Here are some ideas! Social media is a great tool to spread awareness for any number of issues we care about. For MS, you can start with this video, and also follow a number of MS accounts to learn more about the disease and how you can help. Education is one of the biggest keys to raising awareness. It is important to be aware of all the facts. This allows you to educate others who are not part of the community, but are interested. Talking about MS whenever you can and using the knowledge you gained is the best way to become an advocate. Sharing things like stories about patients you’ve met, information about future treatment and the progress that is being made by researchers helps get the word out about the disease. Take your education and advocacy out into the world. Plan an MS event. This can be small with a few of your close friends and family members or large with the whole community. No matter the size, MS events allow you to share information and encourage others to support the cause-either financially or by volunteering their time. Whether you are suffering from this chronic illness or you are caring for someone who is, having a network of individuals in the same situation is important. Support groups bring members of the community together to share experiences and lean on each other. Awareness campaigns are one of the most effective fundraising tools we have at our disposal. Campaigns like the Ice Bucket Challenge and Armstrong’s Live Strong Bracelets have raised millions of dollars to support those living with ALS and cancer respectively. All it takes is an idea and some organization. 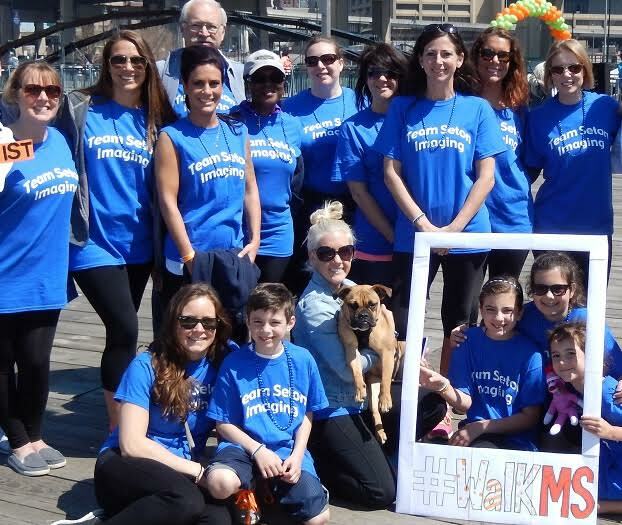 Seton Imaging is a proud supporter of Multiple Scelorsis Awareness Month and Walk MS Day. Walk MS is a day that brings friends, families, and coworkers together to embrace an important cause. We’ve formed a team for Walk MS because we want to experience a great event and help the National MS Society fund research, advocate for change, and help people with MS. We believe in this cause. Can we count on your support? Join us and participate together to make a powerful statement and a real difference for those you care about. Each step we take brings us closer to a world free of MS.